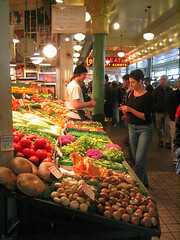 The Official Modest Needs Blog: Are Food Prices Rising Where You Live? Are Food Prices Rising Where You Live? Food-producing countries must relax export controls and divert production away from biofuels to prevent millions more people being driven into poverty by higher food prices, the head of the World Bank, Robert Zoellick, said on Thursday in Washington. Without action to increase the supply of food, an extra 10 million people could fall below the extreme poverty line of $1.25 (76p) a day over the next few months, in addition to the 44 million pushed into poverty by soaring food prices over the past year, he warned. "More poor people are suffering and more people could become poor because of high and volatile food prices," said Zoellick. "We have to put food first and protect the poor and vulnerable, who spend most of their money on food." And while this inflation situation is most dire for the poor in developing nations, the poor in the United States, who also spend a large percentage of their income on food, will also suffer. How soon will we see prices rise on the shelves here in the states? You tell me. Have you seen food prices rise in your area? Which items are more costly now where you live? If you've noticed high prices in the grocery store aisles where you live, tell us about it in the comments. Well shrimp has more than doubled since the accident in the gulf of Mexico. My family relies on mostly protein and veggies because of wheat and corn intolerance. Our bill is always higher than standard because we don't buy bread or sugars unless it is a special occasion. With the cost of food and gas going up we have had to start eating a lot more rice and even skipping meals. We ran out of food entirely between checks this month. We used to be able to feed our family on about $300/month and now it costs more like $500. That may not seem like a lot to some,it is for us. My husband commutes an hour to work, so our gas is high and is nearly $500/month as well. Those two alone are 1/3 of our income..